The Waring Pro Blender range consists of both the MBB & PBB Professional Bar Blender Models, these are the commercial grade food and beverage blenders for home use. The quality construction on the Waring Pro Blenders has outstanding durability and the stunning waterfall style looks will compliment any kitchen. This really is a beautiful blender, it’s employed by expert chefs all over the world. A strong traditional looking blender that is manufactured in many color choices differentiates this appliance from everything else on the market. Offering a 2 speed motor unit combined with stainless-steel and self-cleaning blades, this particular blender is much more than adequate for domestic use. A beautiful looking heavy duty base sets the tone for the Waring Pro Blender. Sitting comfortably on top of this base is the gorgeous forty ounce clover-leaf designed glass jug. Standing 15inch tall this blender easily fits under my kitchen units, but then again this is probably going to be the nicest looking blender I will ever own so why would I want to hide it away! The Jar on the Waring Pro blender series is aesthetically designed and a huge size at forty ounces. This not only translates to convenient single batches of soups, salsas, sauces, milk shakes and smoothies, it looks spectacular and actually complements the base very well. The durable blender base is available in seven distinctive colors, retro green, quite white, chili red, metallic red, ebony black, brushed copper and brushed stainless steel. Update: Recently released is the new Metallic Red color Waring PBB225 professional bar blender, as you can see above it looks beautiful, very striking. You can find the Waring PBB225 model for sale on Amazon right now . Both the PBB and MBB food and beverage blenders are equipped with commercially rated heavy duty motors which are operated by a stylish toggle switch at the front of the blender which has two simple speed settings, slow and fast. You don’t have any complex press/twist securing procedure like some appliances. You merely put the jug on top of the base ensuring that it is the correct way round and it locks right in place. Personally I think that this has to be one of its best features, we can all fall into the trap of paying that little bit extra for numerous programs and multiple speeds, only to end up using the same two settings each and every time. So it was very refreshing to read though the manual within ten minutes. I tossed it aside and worked on the ratio of, start it on low and if it’s not blended on that setting flip it to hi. Both the PBB and MBB blenders have self-cleaning cutting blades that claim to rapidly crush ice to create your favorite frozen drinks. This blender does actually do an extremely good job of this, however for a very fine and consistent flow of crushed ice like you see in the movies, I had to follow a couple of basic steps from the tips page in the manual; This was to making sure the blades are covered by the liquid then slowly feed the ice through the lid insert whilst blending. Honestly, this was a pretty easy procedure and like I said this does give the ice a good even texture. If you’re into frozen drinks or milk shakes you may want to check out the 32oz stainless steel carafe that can be purchased separately or comes complete with Model PBB25. It keeps the drinks lovely and cold for much longer than the glass one… Great in the summer! In fact the Waring PBB25 professional bar blender is actually the most popular right now. This seems mainly due to its stainless steel carafe. But please be aware, if you go for this model you will be paying at least $40 more than if you opt for the glass jar version. Plus it comes in just one color base, ebony black You can actually buy the stainless steel jar separately so that you have both the glass and a stainless steel jars with your choice of base color. I often wonder if that’s not clear to consumers. 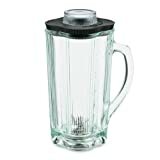 For those of you that have a Waring Pro blender and would like to upgrade, you can find the steel jar in our parts store, it generally sells for around $75. The model number for both the glass and the steel jar is CAC34, they both come complete with the blade and lid. The main disadvantage here is the blender can’t be left unattended whilst blending on high speed due to the jug vibrating so much; in fact I actually have to place my hand on the handle of the blender just to keep it still. This was something I had heard before with this particular blender but just assumed they had maybe over-filled it . Anyway to be honest it wasn’t that big a deal to me as it blends everything in seconds! The only other reported drawbacks on this blender include minor things such as an inflexible lid, and that the electric motor can be somewhat noisy on the faster setting. 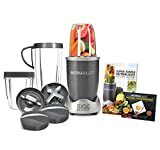 This blender has received a credible 105 five star ratings on Amazon, averaging 4 stars overall from a total of around 198 reviews. The Waring Pro blender is undoubtedly a great addition to any cooking area. You will not be dissatisfied with the construction or quality of parts in this appliance as you blend, mix, crush and grind food items in mere seconds. 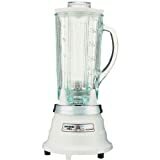 It’s a high quality and durable blender, with a timeless and classic looking base. This base complements the Waring food and beverage blender Series perfectly and whether you are blending or frothing up, a milk-shake, a smoothie, soup or salsa you may well question why you didn’t buy a Waring Pro blender in the past.